This afternoon I made a mad dash around town to kitchen stores, craft stores, a comic shop, and even thought about visiting a place where hand crafted glassware is made. The ultimate container for my olive oil would be a 3.5 cm diameter cylinder perhaps 10 cm long, with an opening along the rounded side that would allow the oil to be poured in. Both the faces of the cylinder would have to be optically transparent and not distort the light. The kitchen store had nothing I could use. Many of the spice jars were made of glass, but there were so many imperfections it would have dispersed the laser beam. The Craft store had some promising plastic containers, rectangular, but made with translucent material. No good. I was tempted to use some of the plastic packaging they had for candles, but the seams were not sealed, the boxes were too large, and it would not have worked. I remembered that our local comic shop (called The Comic Shop), sells dice which comes in square-ish containers. Size would be an issue if I could not find a larger solenoid. 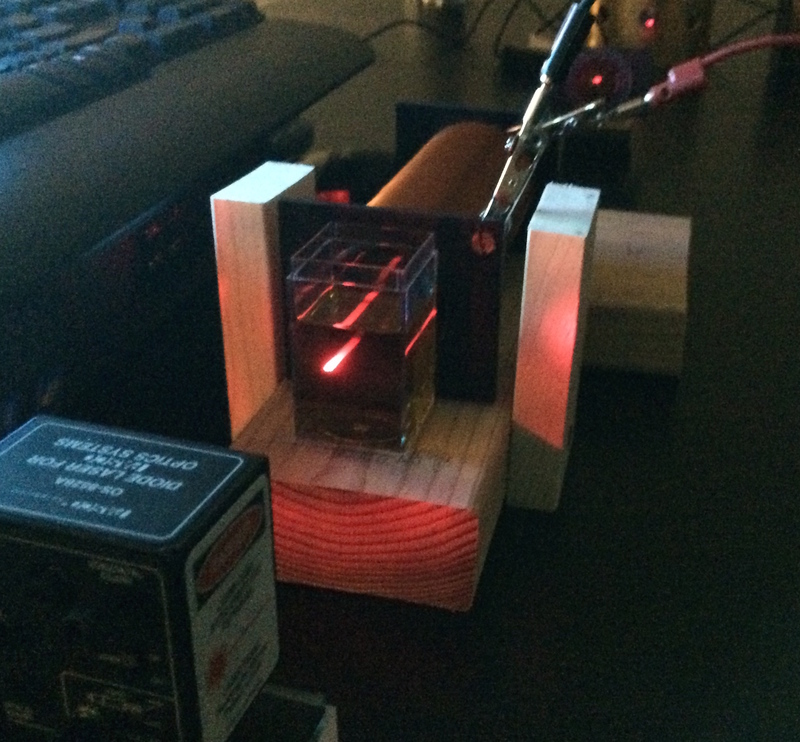 In the foreground a 650nm laser beams through a container of olive oil. Directly behind it is the solenoid. Beyond that is a polarizing filter and finally the photometer. As you can see, I am still using the same solenoid, and the dice box won’t fit inside. The laser beam traveling through the olive oil does make a nice line though. Because the oil is just or only in front of the mouth of the solenoid, its only getting fringe magnetic field lines. Not nearly enough to rotate the laser light to any measurable extent. I notices absolutely no rotation in the beam with the oil in this position. I am going to try and find a larger solenoid, or a smaller container and try again tomorrow.